Pick a ball Throw it to me fast. Dares are waiting for you. 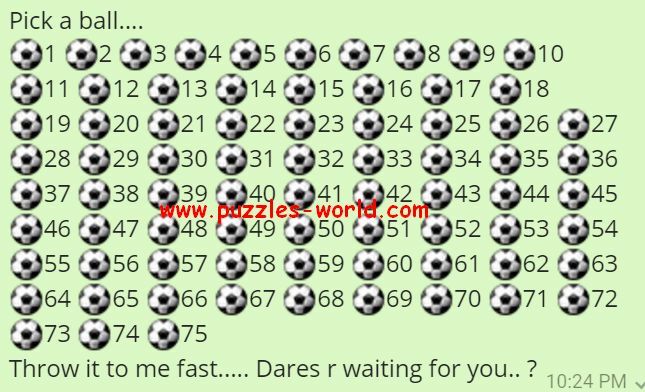 Throw it to me fast..... Dares r waiting for you.. ? 5. What'S Ur Deepest Secret? 9. Put Your Status For A Day Saying "I Am Mad"
36. Put Your Status For A Day Saying "I ❤The First Letter Of Your Lover"
51. What'S On Ur Mind..
55. Dance N Share Tat Video. 68. Most Romantic Scene U Have Ever Seen. 73. Where Would You Like To Meet Me.? 74. Whenever U Meet Give Me A Hug. 75. Whenever U Meet Me Give Me A Kiss.